The South Bank Show ITV Archive – Directors Cut Productions Ltd.
A major archive comprising hundreds of hours of unseen interviews with many of the world’s leading artistic figures has been established at the University of Leeds. Thousands of video tapes from the 32 year run of The South Bank Show have been acquired from ITV by the University. The cultural coup has been driven by the University’s Chancellor Melvyn Bragg, who conceived, edited and presented the flagship arts show throughout its run. 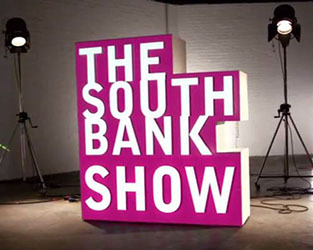 The South Bank Show, with its distinctive theme tune and opening credits, was a mainstay of British living rooms on Sunday nights from 1978 until 2010 and is widely celebrated for the way it combined high art and popular culture for a mass audience. Virtually every leading light from all branches of the arts – from sculpture to cinema, theatre to pop music – joined Melvyn Bragg at some stage to film at least two hours of in-depth interview for one of the 760 or so shows, with the list of interviewees and programme topics reading like an encyclopedia of the 20th and 21st century cultural landscape. The hundreds of interviewees ranged from Paul McCartney, its very first interviewee, through to luminaries such as Simon Rattle, Rudolf Nureyev, Norman Mailer, Joseph Heller, Eric Clapton, David Lean, Tracey Emin, Francis Bacon, Paula Rego, Dolly Parton, Ingmar Bergman, Victoria Wood, William Golding, Judi Dench, David Hockney, Harold Pinter, Luciano Pavarotti, Frank Auerbach, Alan Bennett, Jonathan Miller, Martin Scorsese and Dennis Potter, and subjects as diverse as Ralph Vaughan Williams, The Smiths, Brookside, Scottish writers, prison drama groups, rap and Puerto Rican ghetto music. From the original interview tapes, usually only 15 or 20 minutes were broadcast, with the rest rarely, if ever, viewed again after the initial editing process. This means that on the almost 8,500 tapes and reels of film now carefully stored in climate-controlled conditions as part of the University of Leeds Library’s Special Collections, there are up to 700 hours of footage providing a rich resource for scholars of music, film, theatre, fine art, literature and more.